It's been one week since our world was turned upside down and topsy-turvy in quite possibly the best way there is. To tell the world about our new addition, this special blog will be called "He Said/She Said," and give readers a look into this new adventures from both of our perspectives. As I sit down to write this on Saturday night, Feb. 25, the thought never crossed my mind that I would already be a father of two for a full week. Grace was a week late and for some reason, I was sure that Charlotte would follow her older sister's lead. We'll blame that for Mary and I's total lack of preparedness. I'm not sure how true it actually is, but that's what we are going to blame it on. 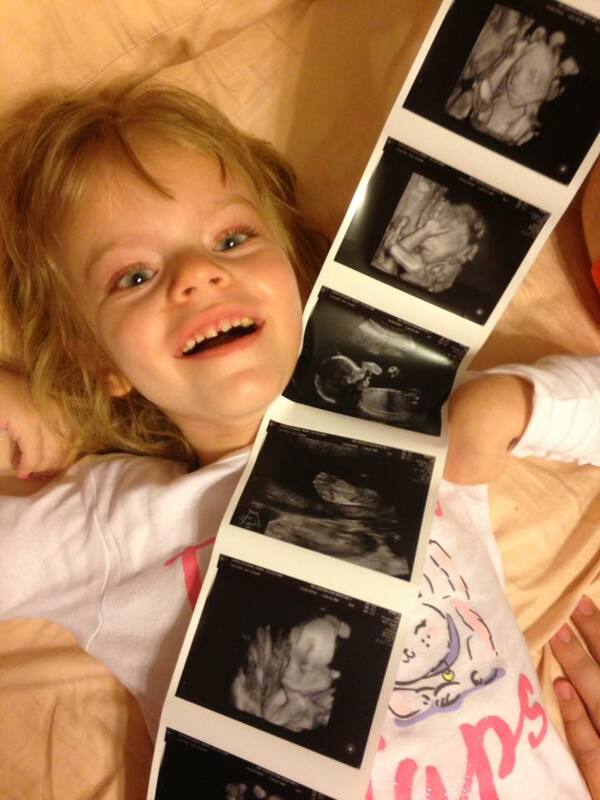 Grace was excited to see her little sister on the sonogram before we got to meet her in person! But here we are, Mary holding one beautiful girl, while the other one sleeps in her room across the hall. The crib I was going to rebuild last Friday still lays in pieces in what will be Charlotte's room someday, hopefully before she turns 18 and goes off to college, hopefully to become a doctor or astronaut or some sort of hybrid of the two. Our nurse wrote on our chart that our goal for the day was to have a baby! You see, my grand plan was to build the crib that Friday after we got home from our appointment with Dr. Eden, Mary's OB for this birth. We already had a busy morning of PT with Grace, followed by lunch at the Cracker Barrel, where I ate my weight in country fried steak and oggled the cute little dresses they had in the store. Girls clothes are cute and I have a weakness for anything that would make either of my girls even cuter. This will probably come back to haunt me over the next two decades. 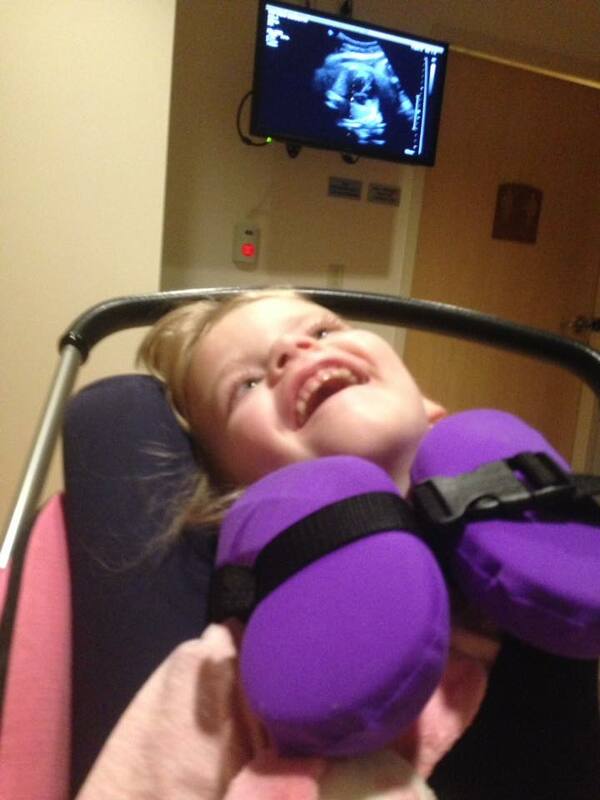 After no problems with Mary's non-stress test, which is actually very stressful, we made our way to the sonogram room. 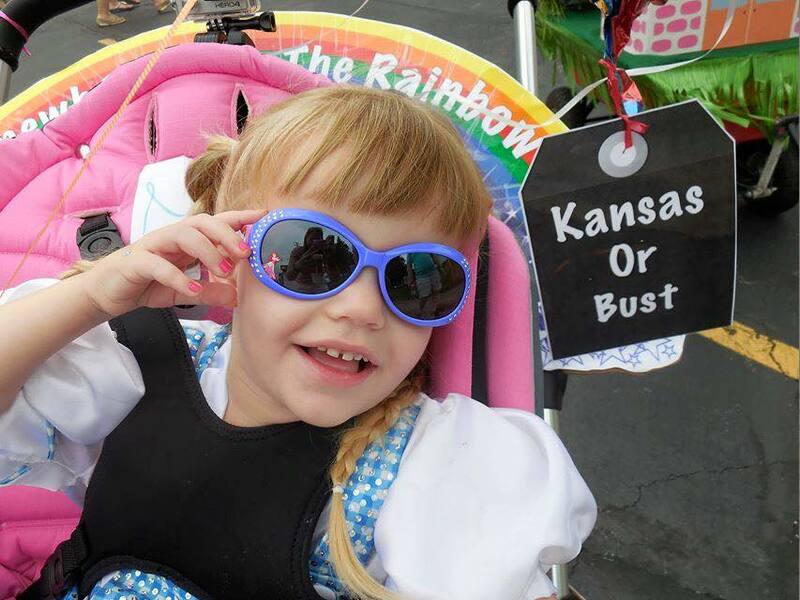 The week before we had watched as the pictures on the screen showed little strands of hair sprouting up from the gray blob on the screen that was Charlotte's noggin. Grace didn't have much hair until well after she was a year old, so the thought of this was pretty cool and a new experience for our family. This week was different though. The person who did the sonogram took longer, measuring several different areas and trying to find different angles. I didn't panic outwardly, but inside, I was a ball of nerves, wondering if anything was going wrong. Check out those inky feet! The short answer was there wasn't… yet. Dr. Eden told us that Mary was significant lower on amniotic fluid than the previous week and said that he was going to send the results to another doctor to see what he thought. As he left us to make the call, he opined that we would be having the baby either that day or the next. I remember looking at Mary and us both having the same reaction. 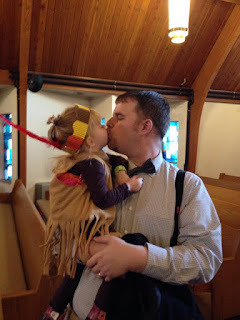 I won't say what I actually said, because this is a family blog, but needless to say I was shocked. After a few moments of panic, I changed course and tried to encourage Mary that everything was going to be ok. We had to go admit her to St. John's Hospital, but first we thought we would go across the street to where my mom worked and let her know that her newest granddaughter had the patience of a gnat. This induced panic spell number two as my mom replied "Yeah, I kind of figured that would happen." That was followed by me grumbling at my mother for five minutes about why she didn't tell us this, but eventually I got over it and we continued our journey. Getting some of those first few snuggles! The plan was to get Mary checked into St. John's, then I would drop off Grace at my parents' house, where my sister Mikaela and her son Quincy were waiting for her. With Mary's parents in Florida, Mikaela was gracious enough to drive up from Arnold, MO to watch Grace until my mom and dad could get off work. I would then drive over to Hillsboro and get some things that we might need at the hospital (extra clothes, contact solution, whiskey, etc.). At about 6:30, I got a call from Mary saying that the procedure they originally planned for 8 p.m. was moved up to 7 p.m., meaning that I had a half hour to get to Springfield before doctors sawed my wife in half and yanked a human being out of her. For all you know, I didn't panic. And if you believe that, I've got some beach from property in Pitman Township to sell you. So with the urgency of a man with his pants on fire, I threw all of our things together, drove to my parents house, dropped off Grace's bag, took a piece of pizza that my sister had offered and hit the road once again. By this time 7 p.m. had come and gone, but Mary said that the doctor had been called away to another delivery. Still I felt like I was in Cannonball Run or Smokey and the Bandit, or some other Academy Award winning tome. I kept my speeding to a minimum despite the urgency and made it all the way to Springfield before things got weird again. Grace was really excited to meet Charlotte. As I drove in on 6th Street, everything was fine until I got almost to downtown, where police had the road closed off due to an accident. After nearly sideswiping a vehicle in the next lane, I managed to turn to try to detour around the blockage. I don't know Springfield that well, so this was the last thing I wanted and ultimately I found myself going the wrong way on a one-way street. Always a great way to spice up an evening. After turning myself around, I finally got my bearings and made it to the hospital with just minutes to spare. And by minutes, I mean roughly five hours. 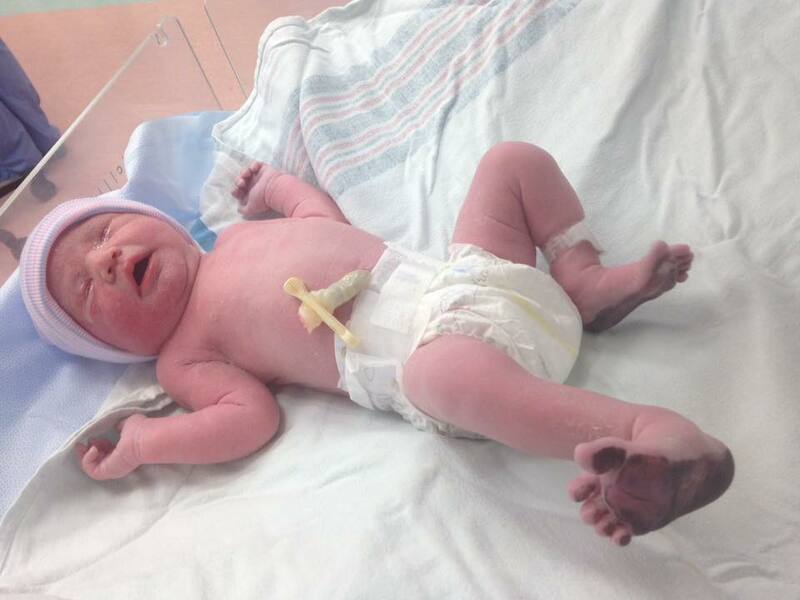 The C-Section that was going to start at 7 p.m. and caused me to nearly get in a head on collision actually began about 1 a.m. on Saturday, Feb. 18. This was the first time I had been in the delivery room, after opting out of Grace's birth due to fear that I would pass out and put two of us in the hospital. This time I felt more prepared and was excited to meet the little girl that had disregarded our carefully laid plans and procrastination. Reading a new book to Miss Charlotte. As the doctors went to work, I tried to help Mary as much as I could, keeping my nerves to a minimum despite the feeling that this was the most important person in the world to me lying on the operating table. Soon we heard someone say, "Look at all that hair!" followed by the sweetest cry I've ever heard. 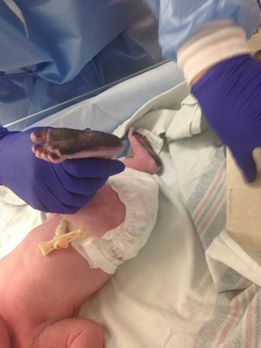 I got a quick peek at all 7 pounds, 20 inches of Charlotte Grace Herschelman before they went to hose her off and get all of her vital info. Once she was clean, I got to spend a few moments alone with her (with the nurses there of course), something I also didn't do with Grace. I watched as they measured her, weighed her and inked up her feet, thinking the whole time how perfect she was. Once she was all done with her other duties, I was able to hold her by Mary and show her the miracle that was Charlotte Grace. It was love at first sight for the both of us and it hasn't stopped since. We've had some battles with car seats and sleep deprivation, but it already feels like she has been a part of our family forever. My employers/in-laws allowed me to take my two weeks of vacation off to be with Charlotte, Mary and Grace, something they offered the last time, but I didn't take advantage of. This time, not being able to pick up Grace, I knew Mary needed me to be there and I have jumped head first into my responsibilities with Grace Lou. 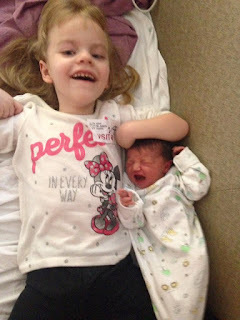 The first of many sisterly headlocks. This is probably the first year that I haven't made it to a regional basketball game since I started at the Journal-News, but I had so much help from my fellow employees that the paper didn't miss a beat. I'll never be able to thank them enough for their generosity. There are still things I'm learning everyday about fatherhood and family life, but I know one thing for sure. These two weeks that I have been able to spend with my girls are special ones and it has truly showed me that above all else, family and God come first in my life. Last Friday (Feb. 17) started out just like most other Fridays do for our family. We got Grace ready for physical therapy in Springfield, and sort of figured our biggest decision for the day would be where to eat lunch. Just for the record, we picked Cracker Barrel, and it was delicious. After lunch, we headed over to the Springfield Clinic for what we thought would be a routine weekly check-up for the baby. 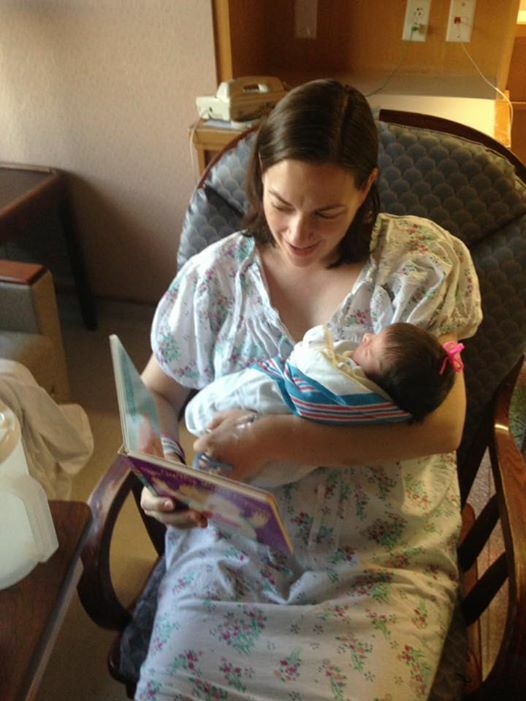 Due to my "advanced maternal age," it included a non-stress test on the heart monitor and a sonogram. I could tell something was up as the sonogram took about twice as long as the week before. 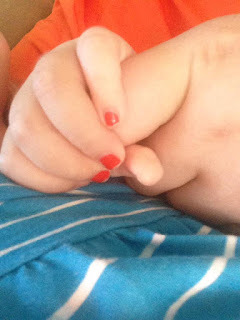 And when it was time to meet with Dr. Eden, he told us it showed low amniotic fluid, and that we would be getting a baby either that day or the next. Hanging out with Uncle Shane. When he left the room to make some phone calls, I think the panic set in for both of us. Each of us had meeting stories to write for the paper. Kyle had already talked about putting the crib together that night, and just in general, we weren't ready at all for Charlotte Grace to make her appearance two weeks early. 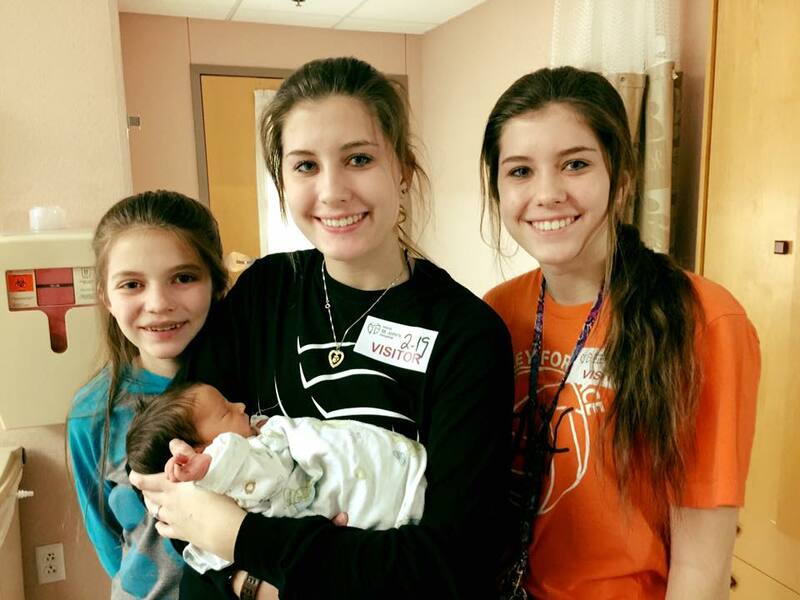 Cousin time with Katelyn, Kayley and Kensey. 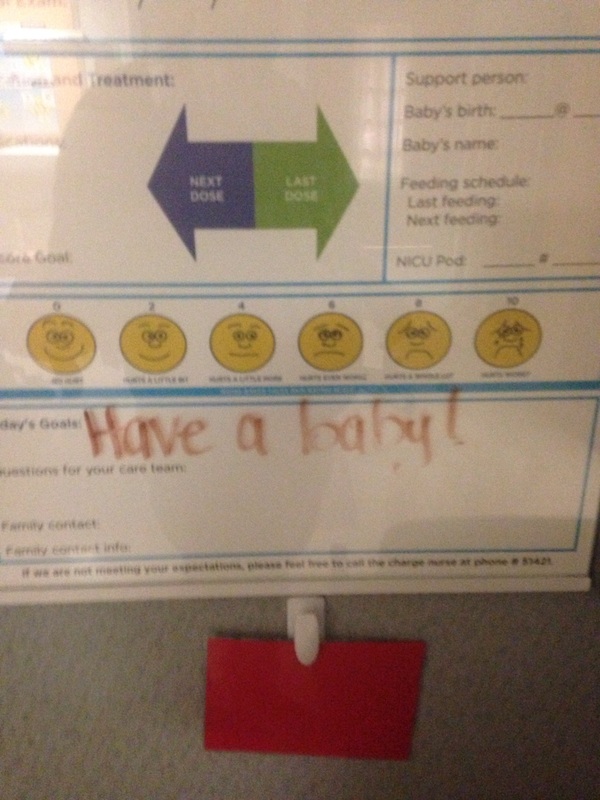 But whether we were ready or not, we were going to become parents again. Kyle and Grace got me all checked into the hospital and then headed back for home to pick up all those things that we never bothered to get ready for the hospital. Kyle's sister met him at his parents' house to keep Grace, and Kyle ran back to our house to get what he needed. 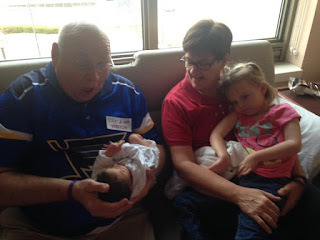 Hanging out with Grandpa and Grandma Galer. I chilled out in the hospital, and killed time texting updates to family members. The nurses at the hospital took great care of me, and told me they thought our c-section would be between 8 and midnight. Then, they came back to say 7:30, and then again to say they thought it would be at 7. When I got ahold of Kyle around 6:45, he was still at our house gathering some clothes for me and Grace, and still an hour from the hospital. I told him not to worry or hurry and that Charlotte and I would be in good hands. Just to be safe in getting back up to Springfield and we would be waiting for him. 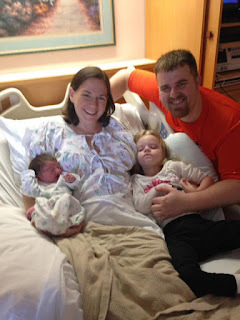 Well, as it turned out, our doctor had been particularly busy that day with deliveries, and Kyle ended up making it in plenty of time for the delivery, which was shortly after 1 a.m. Because I had a c-section with Grace, they recommended that this time around as well. And we were just so happy to have a happy, healthy baby that it didn't matter to us. Hanging out with daddy at home. The first thing the doctor told us was that she had a full head of hair, which was completely different from Grace, who was bald for nearly the first year of her life! After the nurses got her cleaned up, Kyle got to go over and check her out, counting all her fingers and toes. Then they brought her to him to hold, so I could see her too, while they finished up with my c-section. 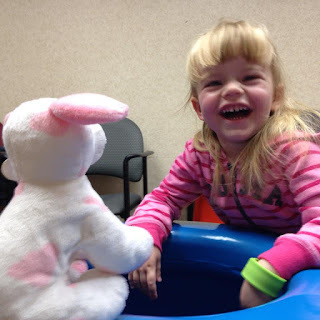 Although, we had to wait several hours for the surgery to begin, once everything started, it sort of became a blur, and it wasn't long before we heard the doctor said, "look at all that hair!" Since then, it has seemed like Charlotte has just always been part of our family. 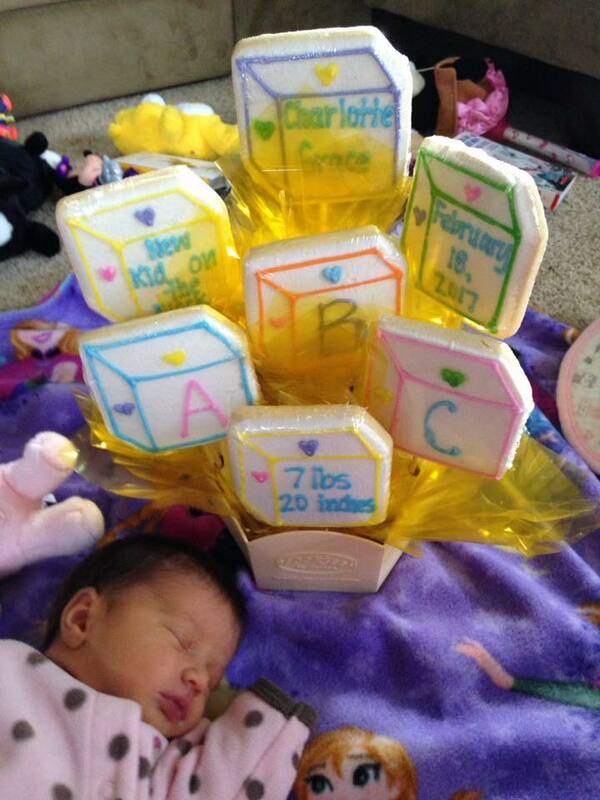 Family and friends have blessed us over and over again! We enjoyed visits at the hospital from family and coworkers, and have been blessed by our church family with meals throughout the week. Slowly but surely, Kyle and I are adjusting to life with a newborn again. One of these times, one of us is going to remember that we have to bring diapers with us when we go somewhere or that sleeping all night is definitely overrated. For the most part, we hang out in our newly refinished basement with the girls laying on a blanket next to each other. Grace seems to enjoy watching Charlotte wiggle and squiggle, and watches over her as she sleeps, seeming to enjoy her role as the protective big sister. I know it will be an adjustment as we find a balance between taking care of both girls, especially when Kyle goes back to work. But we have been so blessed to have the help of our families, who we know will be there every step of the way. First Thursday lunch at The Ariston! We know there are some big challenges ahead on this Grace-Filled Journey, but we have spent the last week, trying to live in each and every day, enjoying all the time we have with both our beautiful daughters, who are already such a blessing in our lives. They say there's a first time for everything, and I think it's the first time in our married life that we have actually been early for anything! 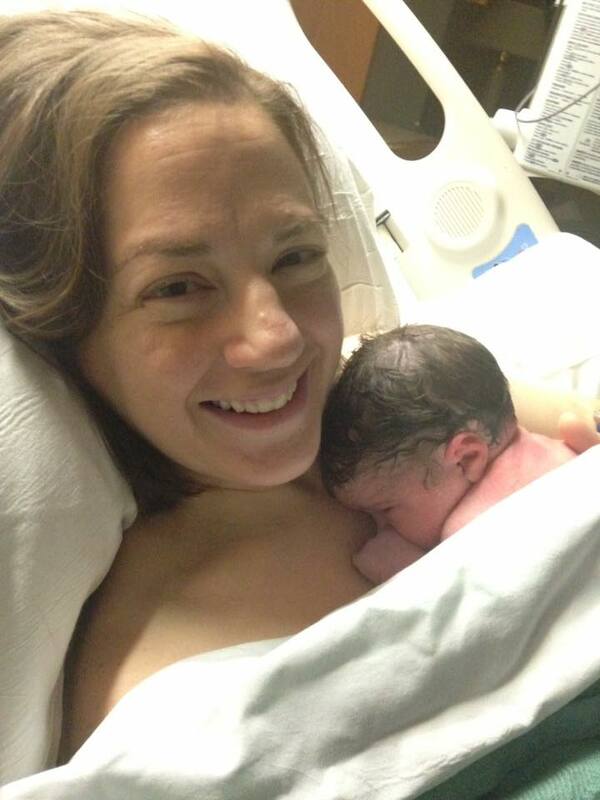 Kyle, Grace and I welcomed Charlotte Grace Herschelman into the world in the wee hours of the morning on Feb. 18, two weeks before she was scheduled to arrive by c-section. We weren't exactly ready, but she came nonetheless. Her arrival started on Friday morning, when Kyle and I took Grace to Springfield for her weekly physical therapy sessions. After lunch at Cracker Barrel, we headed to the Springfield Clinic to see my doctor for what we thought was a routine check-up. However, a sonogram revealed low amniotic fluid, and the doctor came to tell us we would meet Charlotte either Friday or Saturday. As he left the room, Kyle and I both started to panic a little bit. Nevermind the fact that we both had several stories to do up for the paper, but we hadn't had time to clean up Charlotte's room or even put her crib together. And as I tearfully told Kyle, we don't even have a camera! But after getting me settled into the hospital, Kyle was able to get Grace to his parents' house where she would stay, and run home and get a few things for us, including a camera. Thanks to several other deliveries that night, Kyle even made it back to help me welcome Charlotte into the world. 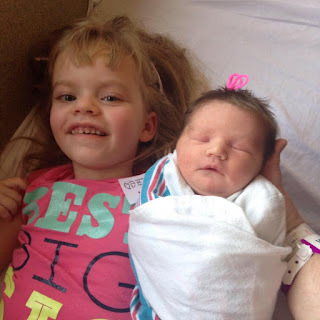 She's absolutely perfect, and Grace seems to be enamored with her new role as a big sister. 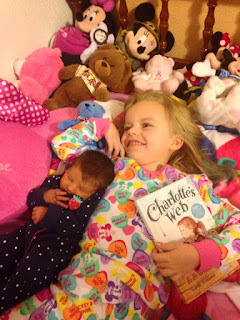 Grace loves to watch Charlotte wiggle and squiggle, and we have enjoyed reading books to both of them. As we have enjoyed being home with them the past few days, it truly feels like our family is complete. 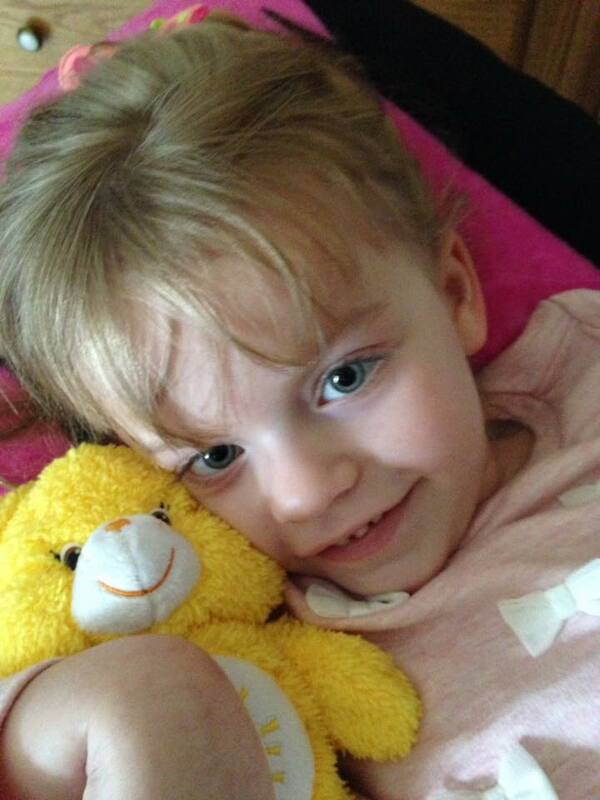 However, although Charlotte's delivery came early, her journey actually began more than two years ago. 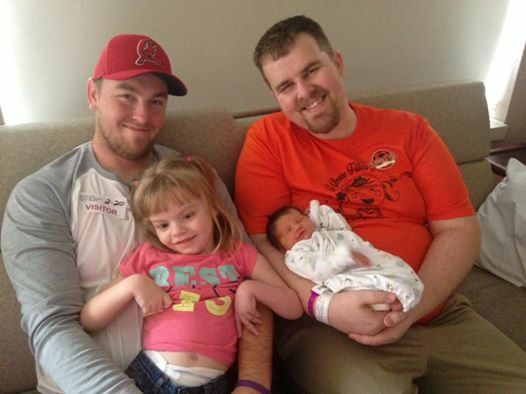 Even before we knew what INAD stood for, Kyle and I knew we wanted a sibling for Grace. We are both very close with our adult siblings, and wanted Grace to have that chance too. 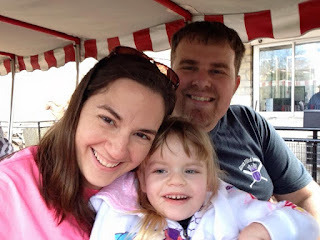 But then Grace was diagnosed with INAD, where the odds were 25 percent of having another child with INAD using conventional methods, and we just didn't think that was fair. So, we began talking with Grace's geneticist about the possibility of in vitro fertilization or IVF, with pre-genetic testing of the embryos. I admit I didn't know much about the process, but I studied genetics in high school, and I figured how hard could it be? Turns out, a lot harder than I thought, but worth every single shot, every single hormone and every single trip to St. Louis. Since most of Grace's doctors are in St. Louis through Washington University and Children's Hospital, we opted to see Dr. Kenan Omurtag at Washington University, and it was a great experience all the way around. 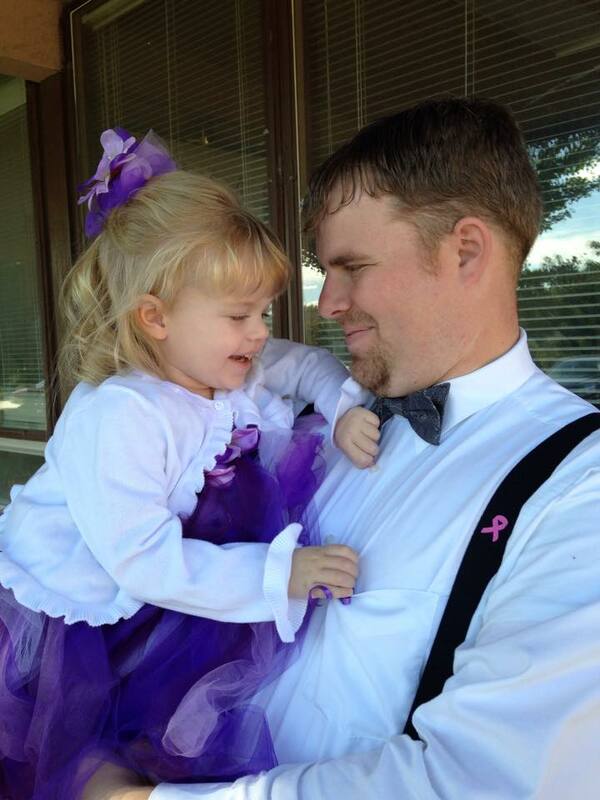 He was just as invested as we were in helping to expand our family, and there with us every step of the way. The first time we tried it, we were unsuccessful at getting pregnant. Originally, we were just going to try the one time, but our doctor encouraged us to give it one more try. This time, we were able to have 7 embryos tested for INAD, including two that had two healthy copies of the gene, meaning that Charlotte isn't even a carrier for INAD. 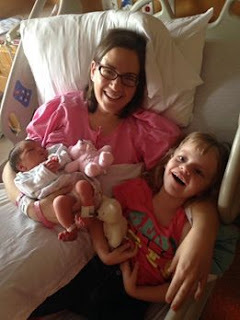 Although our odds were increased to implant more than one embryo, the idea of taking care of twins and Grace seemed like a big job, and we were lucky enough to get pregnant the second time around. I never counted all the shots or all the medicines we had to take, though I'm sure they numbered more than 100. 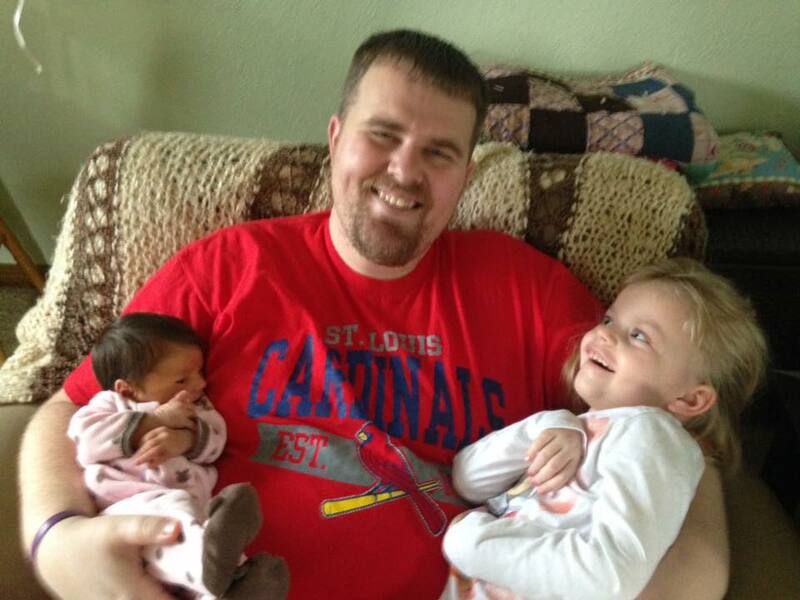 I never measured all the miles we drove back and forth to St. Louis for blood work and ultrasounds. Instead, we found ourselves blessed with the chance to add to our little family, a chance we never would have had without the science and technology of IVF. Although it's one of the hardest things we have ever done, we will forever be grateful that Charlotte Grace Herschelman arrived in our lives, even if it was early for the first, and probably the last time, on this Grace-Filled Journey. It seems hard to believe that we started our "happy days" journey 1,000 days ago. For those keeping track, that's more than two and a half years, and it's a safe bet to say that lots has changed since we started. Day 1 - Our first official happy days photo. Day 4 - She's always the star of our happy days. 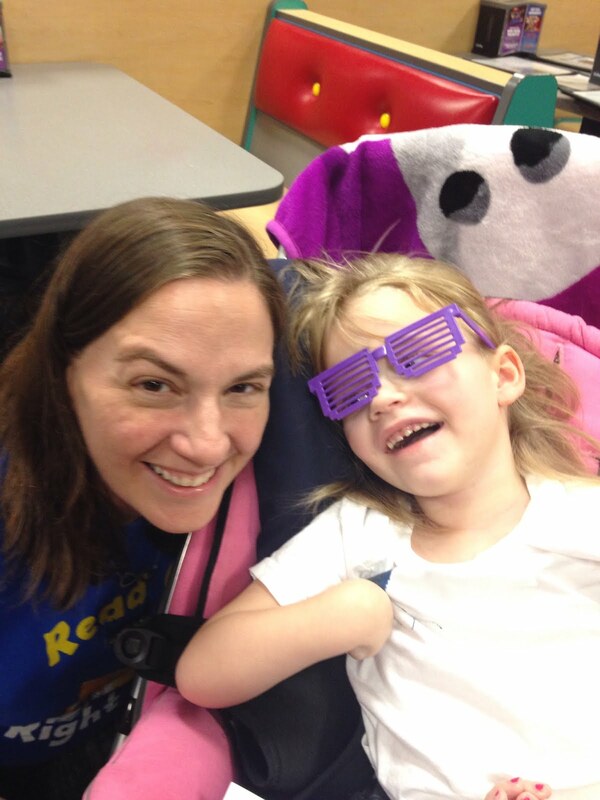 We have to give credit to our friend, Stephanie Carls, for introducing us to the idea of #100happydays. She had done it on Facebook, and we decided to give it a try. The premise is quite simple. Just look for something that makes you happy every day for 100 days in a row. It had been a particularly trying time for us, and we thought it might help give us a new outlook on life. The first picture we posted was a photo of the two of us snuggling on the couch, and we both posted the same photo to start. After that, most of our photos included Grace, because she seems to make us happy most of the time. Day 23 - Playing with my favorite princess at our house. Day 145 - Grace was the flowergirl at my cousin Rachel's wedding. 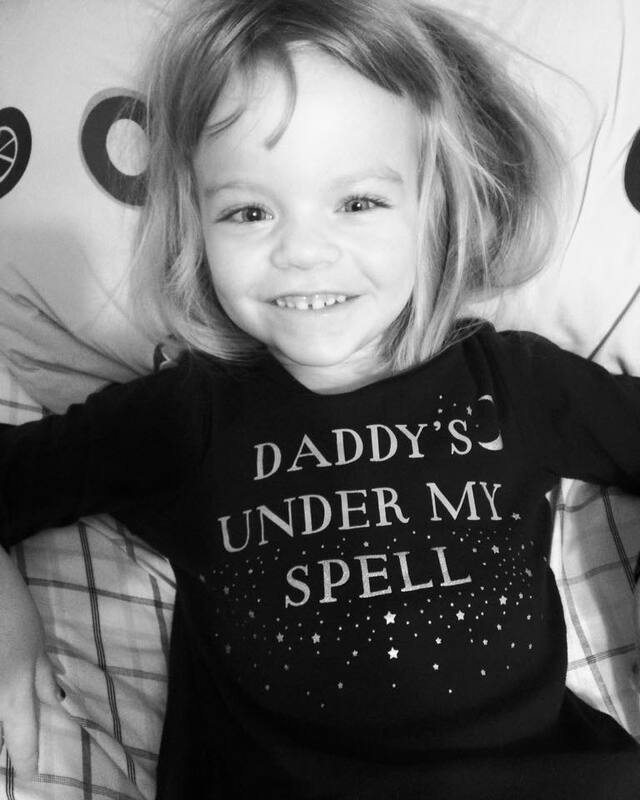 Grace was about two and a half when we started our happy days campaign, and although we were well involved with physical therapy several times a week, she had not yet been diagnosed with INAD. It seems like we've learned a lot since then. And though the premise is simple, some days it was tough to find something that made us happy. But that's also the beauty of the concept. It doesn't necessarily mean that you have to have 100 happy days in a row, you just have to find happy moments in those days. Even on days where we felt defeated, we always stop and find a moment in the day that made us happy. Day 190 - Kisses at the preschool Thanksgiving program. Day 193 - Working hard during physical therapy. 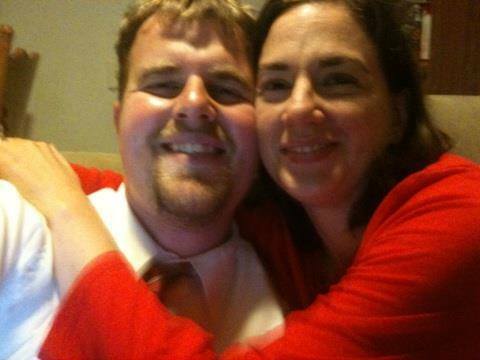 Very quickly, our 100 days was up, and since it was something we had become accustomed to, Kyle and I decided we would keep up the project on our own, and adopted the hastag #foreverhappydays. We also wrote a blog when we hit the 500 day mark, and just this weekend, we hit day 1,000. Although it was something Kyle and I noticed, we were a little surprised to see that others were excited for us to reach this milestone too. Kyle's sister asked if we were going to do anything special to celebrate, and his aunt posted on my Facebook wall how excited she was. Even a friend at church stopped to tell us how much our happy days photos have blessed her. 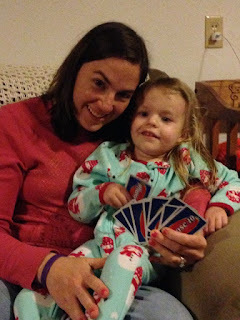 Day 343 - Family game night at home. Day 451 - Our Dorothy in the Old Settlers Kiddie Parade. 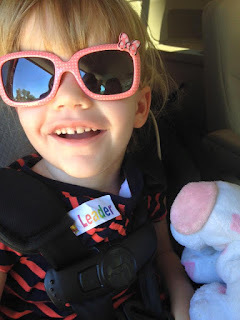 Day 492 - Grace loves to be the leader at preschool. But the more we talked about it, the more we realized that we didn't want to do something big or special to commemorate the 1,000 day milestone. 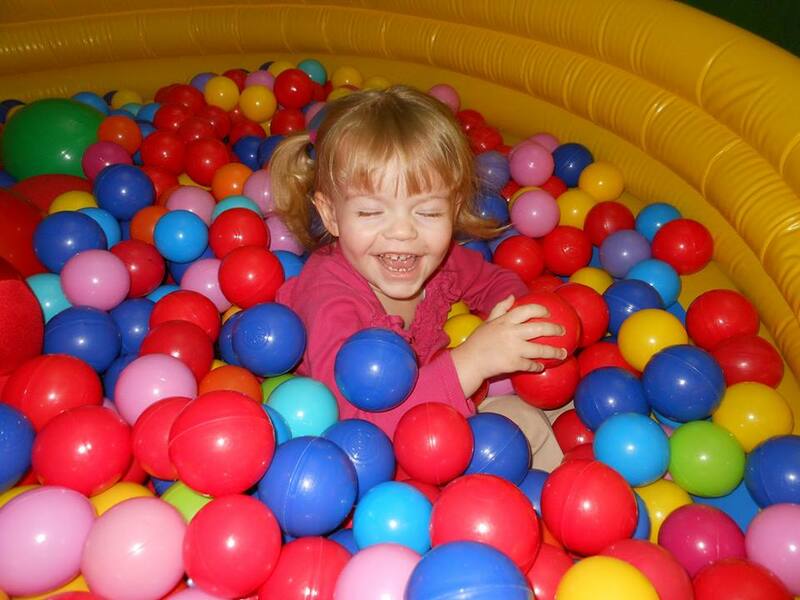 Because #foreverhappydays is about finding happiness in all the little moments. We know that all the days aren't happy, and that life is often hard and unfair. But finding happiness starts small. It starts with letting go of what you expected your life to be, and finding happiness in the life you live each and every day. I wake up every single morning wishing that Grace would run into my bedroom, jump on the bed and wake me up with a big kiss. And I'd even welcome that at 5 a.m.! Yes, that would make me happy. But the reality of our life is that at this point, that's not a possibility. So, instead of hugs and "I love yous," I find happiness in Grace's smile, and the way that she appreciates the little things in life. 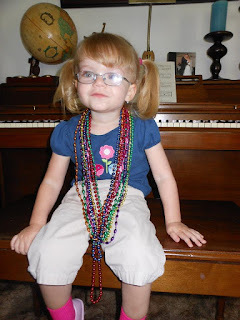 Things like her favorite books, Minnie Mouse and all kinds of music. But most of all, Grace is happy when those she loves look at her and smile. I love to tell her about my day at work or things that I liked when I was her age. And even though she can't answer, I always ask about her day. She responds with a smile, and I know that she's found happy moments in her day too. Day 533: No caption needed . . .
Day 641 - Daddy's favorite ride at Walt Disney World. Day 669 - Train ride at the St. Louis Zoo. In the end, we decided to make a video for Facebook, thanking everyone who has joined our Grace-Filled Journey and continues to watch for our #foreverhappydays photos each and every day. We ended it with a quote that Kyle's sister sent me after Grace was diagnosed with INAD. "When life gives you 100 reasons to cry, show it you have 1,000 reasons to smile." There are some days that my tears are bigger than my smile, but #foreverhappydays reminds me to find that something that makes me happy. Most of the time, it's Kyle and Grace and the time we get to spend together. And through all our challenges, I feel blessed to call them my family. Day 906: Sonogram pictures of her new little sister. 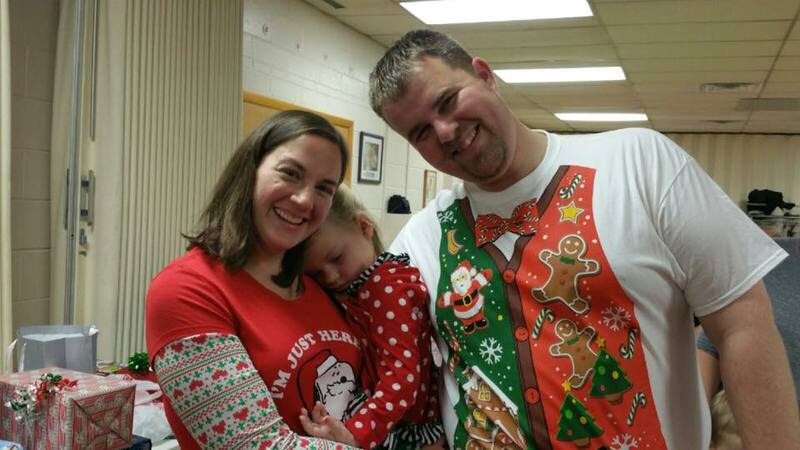 Day 943: Crazy Christmas shirts! Day 996: There's ALWAYS a reason to smile each and every day! Over the past 1,000 days, we've learned to cherish the time that we have together and keep looking for those moments that make us happy. It's not always easy, but it's definitely always worth it. singing your song. Because it's all good." It's been several years since Kyle's aunt, Karen, introduced us to the infamous Pete the Cat. Though we had never heard of the groovy, blue cat, he quickly became a favorite in our house, mostly for the great message of his books. Pete's motto for life is simply to keep on singing no matter what life throws your way. Somebody was excited during the Pete the Cat show! And over the years, we've managed to gather quite a collection of Pete books. 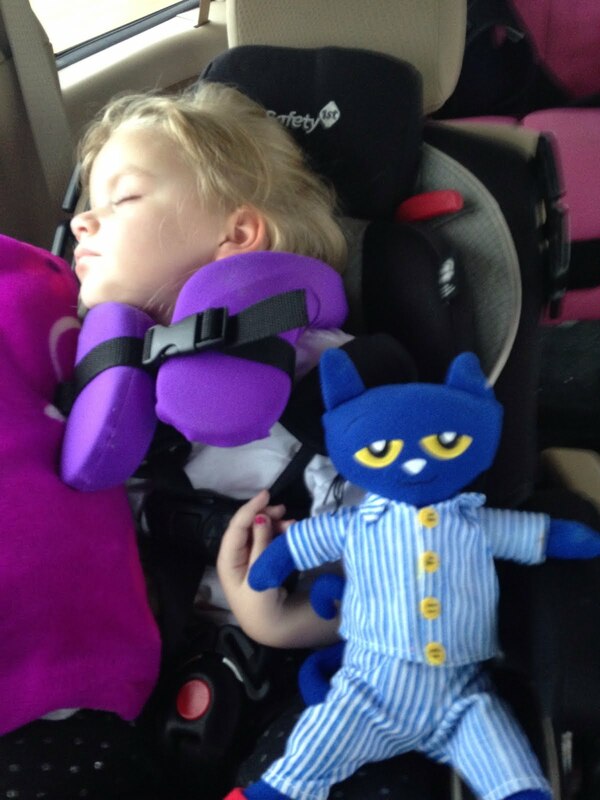 Grace even has a stuffed Pete the Cat, given to her by the Hillsboro High School girls basketball team last season. So, several weeks ago when some friends asked if we wanted to join them for a live Pete the Cat show in Springfield, it was easy to say yes. The program was geared toward small children, and since many schools also participated, tickets to the show at Sangamon Auditorium were reasonable as well. 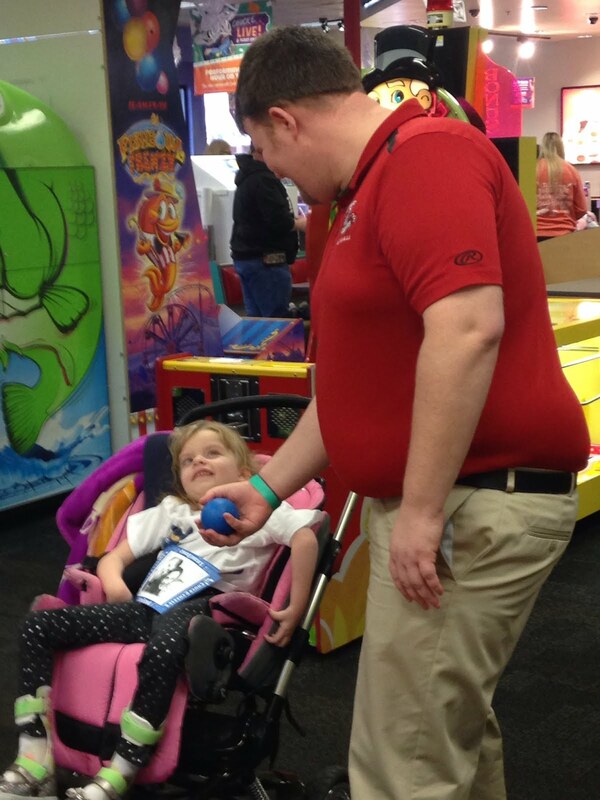 Grace was all smiles watching her daddy play skee ball. 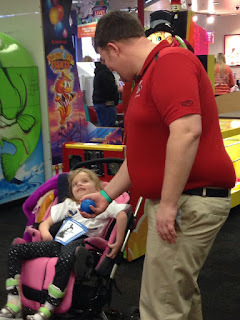 Daddy showed Grace how to throw the balls up the alley. We rearranged Grace's usual physical therapy schedule and made plans to see the show in the morning with our friends and their daycare crew. 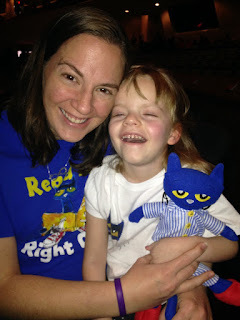 Last year for Christmas, Grace and I even got coordinating Pete the Cat T-shirts, so we looked the part too! Being eight months pregnant, mine was a little snug, but it still worked out okay. 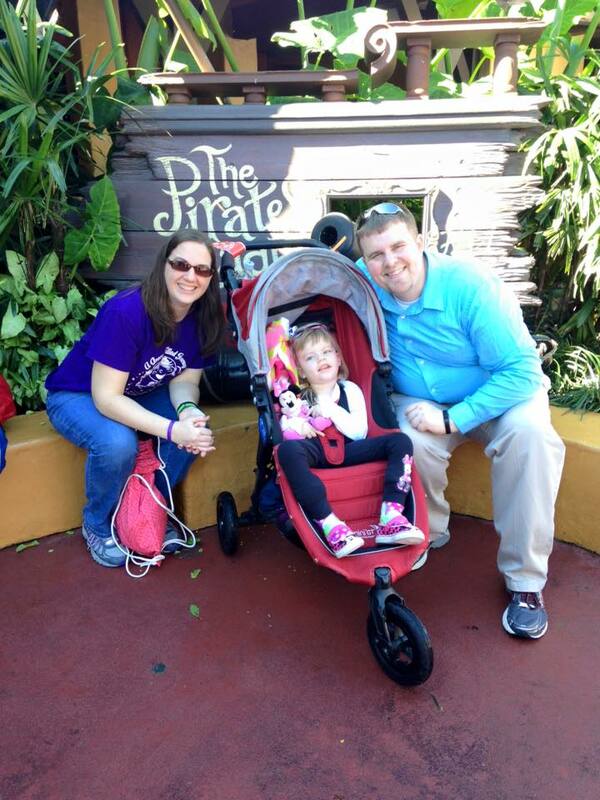 Kyle had booked us accessible seats so we could take Grace's stroller in with us. All the ushers were very helpful in getting us to our seats and making sure we had everything we needed. We decided to hold Grace on our laps throughout the show so she could see better, and we shared snuggling duties throughout the 45-minute performance. Trying their skills on a Simpsons game. I had hoped we might hear some of the songs we sing from the Pete the Cat books during the show, but the story told a tale of its own. And the length was just about perfect for Grace, who seemed to enjoy the music best of all. As part of the story, Pete the Cat gets caught for trespassing and sentenced to live as a house cat for a week. As his story unfolds, he takes his shenanigans to the kids, who learn some life lessons along the way as well. Although I'm not sure Grace understood the entire story, she really enjoyed hearing the songs and would turn her head toward the stage when the music started playing. It was such a fun show to be able to see together. Grace got cool purple sunglasses with her tickets from the games! 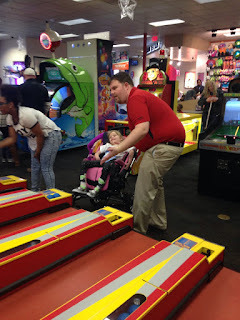 Afterwards, our friends, Jason and Gina, invited us to join their daycare crew at Chuck E. Cheese for pizza and games. 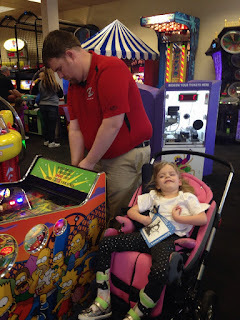 It's been years since either Kyle or I had been to Chuck E. Cheese. In fact, the last time I went, it might have been known as Showbiz Pizza, where I had one of my birthday parties growing up. We ordered our pizza and joined the rest of the crew. It was fun to chat a bit with our friends and watch all the kids enjoy the games and rides. We even made time to play a few games with Grace. Even though she can't really play any of them, she laughed when Kyle and I played skee ball, and managed to earn her enough tickets for some cool, purple sunglasses. We told Grace they were magic, just like the ones Pete the Cat wears. Grace and Pete took a nap on the way home from Springfield. Before we knew it, Grace was getting tired, and we were ready to go home. But we were glad we made time to take the trip. It would have been easy to say no, we couldn't go because Grace wouldn't understand the live production. 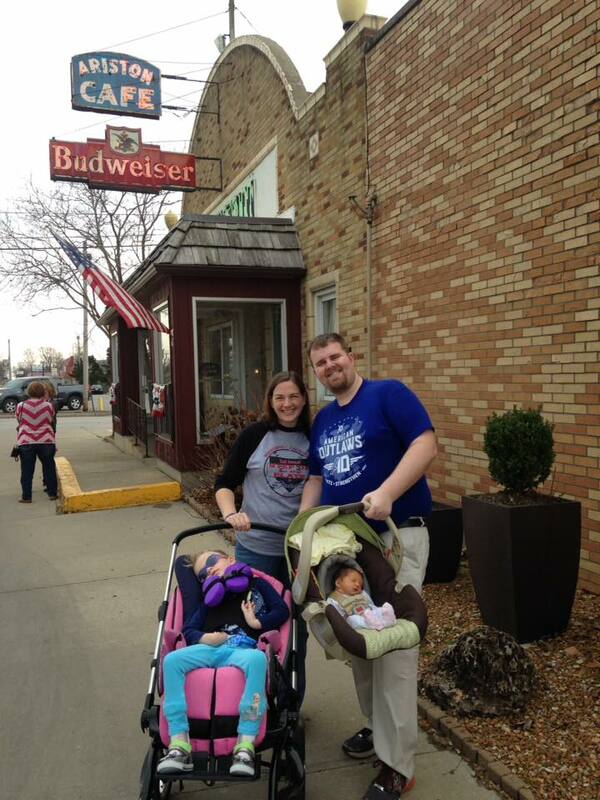 Or, no, we wanted to eat somewhere else for lunch because Grace wouldn't be able to play any of the games. But, instead, we choose to treat Grace like the wonderful, bright-eyed five-year-old little girl that we've grown to love. We held her and shared our delight during the musical and enjoyed her laughter when we played games at Chuck E. Cheese. Life is never going to be "normal" on this Grace-filled journey. And you can choose to focus on that, or you can make the best of all the challenges life throws your way, just like Pete the Cat. Trust me, when you just keep walking along and singing your song, you'll be glad that you did.